Eggs and toast are a healthy choice for breakfast -- as long as they're not the only thing you're eating. 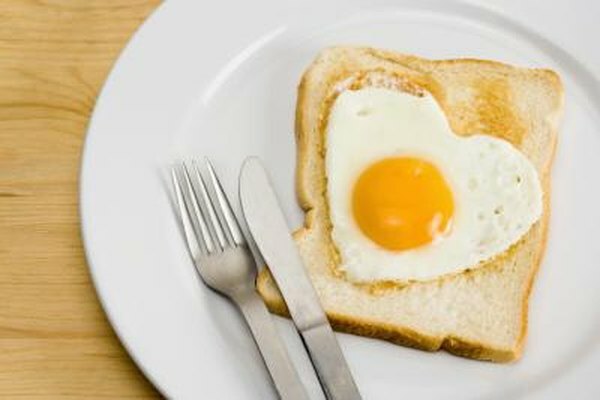 The egg and toast diet, also known as the egg diet or the three-day diet, is a crash-diet regimen that involves eating the same low-calorie foods, including eggs and toast, every day. Talk to your doctor before you make any changes in your diet, especially if you have allergies or health conditions. The creator and origin of the egg and toast diet is unknown. Several versions of the diet have circulated around the Internet as a fast an effective way to lose weight. The diet involves eating a strict meal plan of small portions of low-calorie foods every day, usually for three days. The diet is designed to provide drastic weight loss -- because the dieter follows this low-calorie diet to lose weight as quickly as possible, the egg and toast diet is considered a fad diet. Dieters eat measured portions of protein, fruits and vegetables and grains while following the egg and toast diet. A sample day consists of black coffee, an egg, toast and a banana for breakfast; 1 cup of cottage cheese and 5 crackers for lunch; and two hot dogs, 1/2 cup carrots, a banana, 1 cup of broccoli and 1/2 cup of vanilla ice cream for dinner. This meal plan contains a total of 1,032 calories. A diet consisting of fewer than 1,200 calories per day for women and 1,400 calories per day for men puts dieters at risk for nutritional deficiencies, notes registered dietitian Andrea Wenger Hess in the University of Maryland Medical Center article, "Common-Sense Strategies to Long-Term Weight Loss." Although the egg and toast diet involves eating fresh fruits and vegetables, protein and grains, it is not considered a healthy weight-loss option. Because the diet involves eating the same low-calorie foods every day, the diet is unsustainable unless you plan to follow it forever. As soon as you readopt your normal eating habits, you are likely to gain back any weight you lost while following the diet. Instead of relying on a crash diet to lose weight, stick with a weight-loss program that you can maintain. Get at least 30 minutes of exercise every day to burn extra calories, and make each meal a nutritious variety of fresh fruits and veggies, whole grains and lean protein. Although eggs and toast are OK to eat for breakfast occasionally, eating them every day as part of a fad diet is not a healthy or sustainable way to lose weight.